2018: The museum is carrying out a restoration project – we need volunteers and donations! This model show was built entirely by A.E. Salt of Southampton and took five years to build. There were 14 tables of working models. It was a complete fairground in miniature with its’ own lights and music from the organs. There were over 400 carved human figures. It is a most realistic and beautiful display. ‘The best of its kind in Britain’. Mr A E Salt, the builder of this operational model fairground resided in Southampton. He was a “highly qualified marine engineer during the period of the 1914-18 war”. This gives some indication of his age and his talents. He transferred these technical skills to model-making when he was in his 60s. Mr. Salt built at least three model Galloping horses (gallopers), one of which can be seen in the museum’s display. 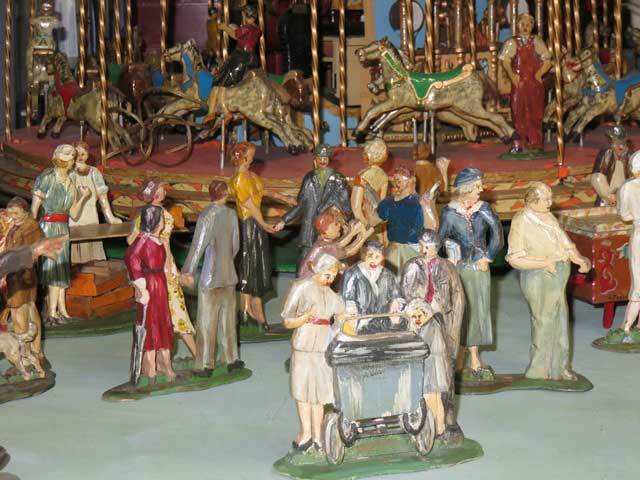 They were all identical in colouring and design and were exact miniature representations of Brett’s fairground ride. Mr Salt exhibited these models at many fetes and shows across the South of England including Brighton, and over, Salisbury and of course Southampton. Salt in fact became “something of a legend in model making circles” with his engineering abilities being way ahead of their time. During this period Salt undertook a long-term project, the product of which is today on display in the museum. Salt began his task in the early 1950s, at the beginning of his retirement. The fairground project was completed by 1958 when 72 year old Salt offered to sell it to Tewkesbury Borough Council. Mr. Salt continued making models into his early 90s before he died. In 1958 the completed fairground model was offered by Mr. Salt to Tewkesbury Borough Council for an unknown amount of money. Why he made the offer to Tewkesbury has been the subject of much speculation, three of which have emerged. Holidays at Home: Due to the model fairgrounds novel appeal it has been suggested by some that it was commissioned as part of the ‘holidays at home; scheme, the aim was to provide local attractions to encourage families to spend leisure time in their locality. 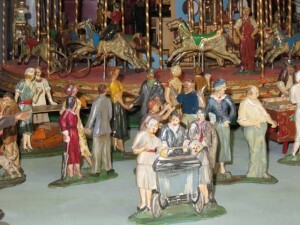 As this scheme was only operational during the Second World War, whilst the model fairground did not arrive in Tewkesbury until some 15 years after the war, the connection seems unlikely. Furthermore, any Tewkesbury Register newspaper references to the holiday at home scheme fail to mention the possibility of the model fairground. Mr. Salt had links with Walker’s Engineering: Walker’s were a locally based engineering firm who manufactured full sized fairground rides. It has therefore been speculated that Walker’s offered technical advice to Mr. Salt, hence he wished to acknowledge this input. No evidence has emerged to support or disprove this theory; however the fact that Mr. Salt made his offer to the Borough Council and not to Walker’s, along with the fact that no reference of Walker’s can be traced in Mr. Salt’s work, perhaps weakens this argument. Tewkesbury’s Historical Mop Fair: This annual event is one of the largest and longest established street fairs in the country. Due to this status which Tewkesbury holds, it has been suggested by some that the town would have seemed the natural home to such a unique celebration of the fair. Whatever motivated Salt to make his offer, it was promptly rejected by the Tewkesbury Borough Council perhaps because it was seen as extravagant by some Councillors. Nonetheless one of the members of the Borough Council in 1958, Councillor Husband, pursued the offer. By 1960 Councillor Husband had reached an agreement with Mr. Salt regarding the fairground which he purchased as a gift for Tewkesbury. What happened to the model when it was in Tewkesbury? Even though the fairground came to Tewkesbury in 1960, it was not until 1968 that it was finally operating for public viewing. Indeed it is first mentioned in the annual Tewkesbury official guides, in the 1968-69 edition. 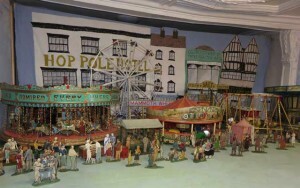 Initially the model fairground was erected in the basement of the Town Hall in Tewkesbury High Street accompanied by a model railway. 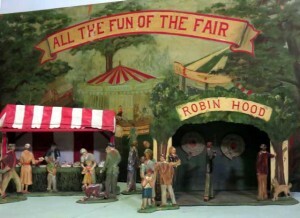 The project to assemble the model fairground was undertaken by at least two volunteers. Oral accounts point to Sam Bassett and Derry Hawlins being involved in setting up the complex system of motors and cables enabling the fairground to be illuminated and working to a backdrop of organ music. Their task was aided by extensive written instructions and diagrams sent by Mr. Salt. Despite all the hard work put into exhibiting the model fairground and railway, it was not a great success, probably due to its location which was difficult to gain access to. Hence it was only officially open for a year in the Town Hall basement. After its closure the models remained in the Town Hall basement unused for many years. How many years the models rested there is uncertain, what is known is that part of the collection moved to the Dowty Club’s premises elsewhere in Tewkesbury unbeknown to the Town Mayor. His surprise upon discovering this movement is recorded in the Town Council minutes of October 1977. It was at this time that the Town Council were reminded that part of the collection was being held by a Mr. Avery who had kindly removed them with the intention of restoring them. However he had neglected to do so and they were retrieved from his garden shed 1977. These recovered items were added to those at the Dowty Club who held them on loan whilst the Town Council deliberated over their future. As a condition of the loan, Dowty’s were to restore part of the collection, whether they fulfilled this requirement is unclear. 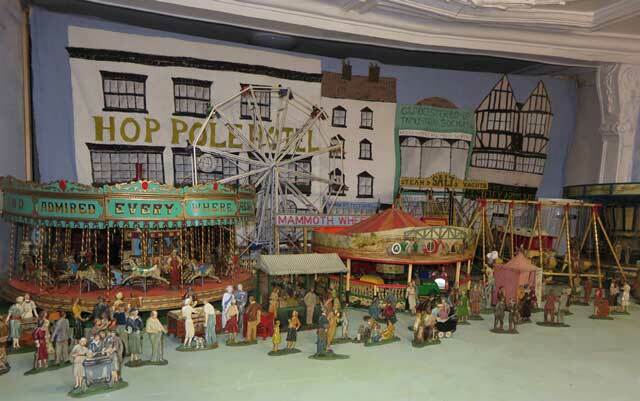 By 1981 Tewkesbury Borough Council had decided that the Trustees of Tewkesbury Museum should take charge of the fairground models. The minutes of the Museum Working Party between October ’81 and January; 84 illustrate the gradual movement of the pieces of the collection from Dowty’s and the Town Hall to the Museum. 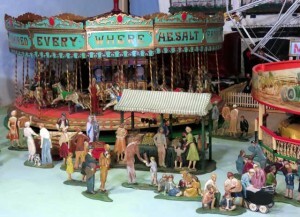 During this period the models were restored and the museum intended to use the fairground as part of a display on Walker’s fairground factory in Tewkesbury. Apart from a minor disruption in 1983 when the museum was closed for renovation and the models were stored along with all other displays by Messrs Pickford’s, the models have remained with the museum to date. The Museum is actively looking for volunteers to restore the models to a working condition; this will enable the models to be shown as Mr. Salt intended them to be. If you are able to help in achieving this, please contact the Museum.